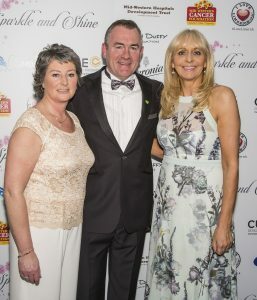 The Sparkle & Shine Ball in con junction with the Keith Duffy Foundation was an outstanding night which saw approx 340 people including a number of celebrities come out in force and amazing style to very generously support three superb charities – Midwest Cancer Foundation , The Symptomatic Breast Unit in the University Hospital Limerick, and Cliona’s Foundation. In an excellent interview with Richard Lynch Miriam spoke of how she became involved with Cliona’s foundation, the importance of its work and the uniqueness of the support the Foundation provides. Check out the interview in our Gallery Section.